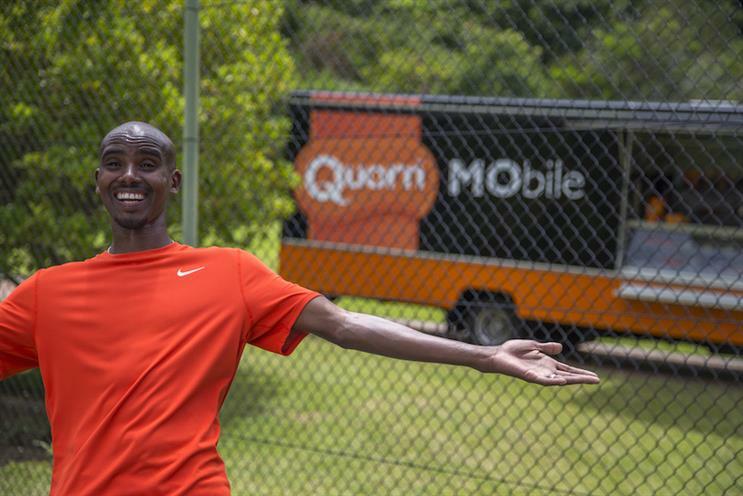 Quorn, the meat-free protein brand, is readying two new spots featuring brand ambassador Mo Farah and is boosting its TV spend to allow it to be on air for 51 weeks during 2016. The Olympic gold medallist long-distance runner, who signed up with Quorn in 2014, will return on New Year's Day with more ads designed to boost the brand’s appeal to not just vegetarians but everyone following a fit and healthy lifestyle. Next year will see the company plan its largest annual investment in TV to date after notching up sales growth of 5.5% in the 52 weeks to December, according to IRI and Kantar. Quorn claims this will increase exposure by 10% compared to 2015, which international marketing director Peter Harrison described as "extremely successful as we continue to recruit more new consumers into the category". The new ads will show Farah involved in football and tennis training and are based on the insight that when exercise is fun, it doesn’t feel like exercise, and when healthy food tastes great, you forget it’s healthy. "The trend towards a reduction in meat consumption continues as part of consumers’ desire to eat more healthily and sustainably," Harrison said. "We hope that with these adverts we will educate consumers about the associated health benefits of eating Quorn to drive meat free category penetration." The brand’s 2016 marketing will also include digital video content from numerous British athletes, new recipe-led content online, PR, wide-reaching sampling activity, social and its continuing sponsorship of the Lawn Tennis Association.